It's that wonderful time of year again...TLA!! Librarians and book lovers come to one town in Texas for the largest state-wide library conference, and of course that's TEXAS! Over 4,500 people have already registered for the event. Not a librarian and would like to attend? You can! Purchase an exhibit hall pass that let's you in all three days. I have hosted a get-together for bloggers and librarians every time we all have a chance to get together and I'm thrilled to partner with YART and SCBWI this year! 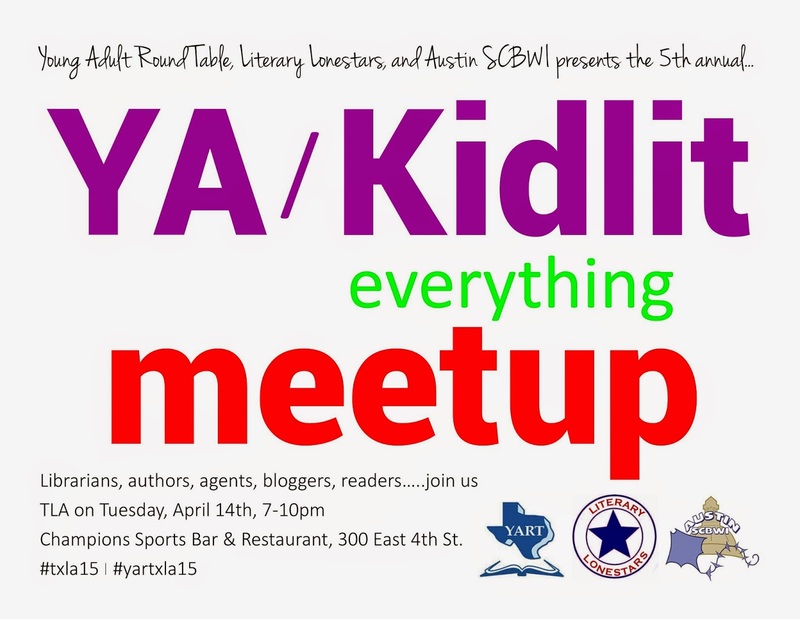 So.....The Young Adult Round Table, Literary Lonestars, and Austin SCBWI present the 5th Annual YA / Kidlit Everything Meetup! This is a come and go event with open invitation to all YA/Kidlit enthusiasts, but please RSVP with Rafflectopter below. There will be appetizers for all to enjoy on us, but please feel free to order dinner on your own. Of course, there's an open bar - silly question! Bar tab on you....hope to see you all there!! I'll be presenting with Naomi Bates, Karen Jensen, and Melissa Marr on Radical RA on Tuesday at 4pm. I'm also moderating the YA Contemporary Literature: The Next Hot Thing with Michelle Knudsen, Chris Lynch, CJ Lyongs, Julie Murphy, Jason Reynolds, and Andrew Smith on Thursday at 1pm. Lastly, I'm on the Local Arrangements Committee and helping with social media for the conference. We've been meeting monthly since last August so we're excited to see the conference finally here! This post will fill you in on everything you need to know to attend TLA like a pro if you have any questions, ask below and I'll try to help!